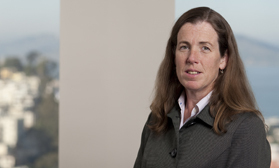 Mary Kate Sullivan is a Firm Shareholder and Severson & Werson’s Financial Services Practice Group Chairperson. She is an experienced commercial litigator, emphasizing individual consumer complaints, consumer class actions, financial institution litigation, and complex business disputes. Ms. Sullivan has extensive experience defending bank and non-bank financial institutions in business disputes arising from complex lending agreements, consumer protection laws and regulatory disclosure requirements and in actions arising from fiduciary relationships, insurance bad faith, and business torts. She is also involved with the Firm’s class action practice, representing mortgage banking and auto finance companies in class actions involving loan payoff and reconveyance procedures, and raising claims based on statutory violations, unfair business practices, breach of contract, and fraud. Ms. Sullivan also has experience with appeals and extraordinary writ proceedings in state and federal appellate courts. Ms. Sullivan received her law degree from the University of California, Hastings College of the Law. She earned her Bachelor of Sciences in Nursing from the University of San Francisco and was a practicing registered nurse for over ten years. She still maintains her nursing license on active status. Before joining Severson & Werson in 1998, Ms. Sullivan practiced at Eisenberg & Spector in San Francisco.